The self-watering container far outperformed the ground, at least insofar as green bean production in the front yard was concerned this year. Nice beans. I have about 8 pole bean vines growing in a container that have been producing a couple decent sized beans every couple days. 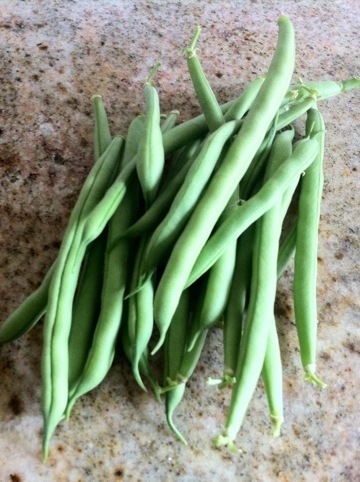 On my to do list for next year is planting at least double the number of green/ string beans. Interesting that you mentioned they were in a self watering container since I noticed my containers which get watered almost daily are far out growing what’s in the ground. I have been suspecting that under watering the ground may be at least part of my production problem. On the subject of watering, I’ve been working on putting together an automated watering system from my Drip Works catalog. Initially I was just going to automate my containers, but now I am thinking of setting up the ground as well. Once one section is set up for watering there is not much more to add a second part unless it is pretty far away. For the containers, I have almost everything planned except for the actual emitters which meter out the water. Most of the emitters are less than a dollar each, so the actual flow rate and configuration of emitter is more of an issue than price. Except in a pretty large container only one emitter should be needed per container. Trying to use one timer for containers and ground means matching emitters so the containers aren’t drowned before the ground has enough water. So far I am up to a bit over $100 to set things up the way I want for my layout of containers and a part of the ground irrigation. This does not include the drip line to water the ground- I haven’t made a final decision on that part yet. About $40 of that cost is for the timer which automates the system. The basic kit which contains a lot of what’s needed for less than the individual pieces was around $35. Depending on your specifics the whole system can probably be put together without the basic kit and buying 1 or 2 parts individually. I haven’t done any price comparisons, and I’ve changed my configuration a few times so far, so don’t take my estimated price for the system as anything more than a rough estimate. A container only system can be put together for less using different components and eliminating the basic kit. Although the in-the-ground beans produced fruit first, the three plants I have in a big homemade self-watering container (thanks to a fellow reveler/friend with whom I do some co-gardening) have far far far outperformed the dirt diggers. As I mentioned before, though, this is the first year I’ve planted anything edible out front, so the soil is not conditioned. The soil in the planter, in contrast, was a more careful mixture of compost, peat moss, a touch of lime, and potter mix. I’m still curious about the difference in taste. The in-the-ground beans came too soon to do a real comparison, but I’m still suspicious that container planters produce fruit that simply is not on par with the more laissez faire ground fare. Have you noticed a difference? I only have the few plants in a container so I have no A/B comparison. Last year I only had a couple in the ground. If I had to guess, the ones in the ground are better. Unless cared for (I don’t) the dirt in a container gets depleted faster. Just my guess there.